Nasty gym germs can cause some seriously gross and uncomfortable skin infections. Dermatologists explain eight of these skin infections, plus what you can do. Hate to break it to you, but your gym is basically a life-sized petri dish. Thanks to all the sweaty bodies swapping machines and sharing hot, humid spaces like the sauna, gyms are a paradise for multiplying microbes — creepy critters just waiting for an opportunity to make their home in the moist, warm creases of your skin. In one 2014 study published in the International Journal of Environmental Research and Public Health, researchers discovered up to 25 different types of bacteria growing in fitness centers on every surface from treadmills to dumbbells. Speaking of barbells, researchers with EllipticalReviews.com found that handheld weights were the germiest equipment in the gym with approximately 48 times more bacteria than your average toilet seat. Ick! And bacteria are just the beginning! Fungi and viruses thrive in gyms, too. These nasty germs can cause some seriously gross (oozing, scaly) and uncomfortable (itchy, burning) skin infections. But, before you cancel your membership or whip out a hazmat suit, be informed. Below, dermatologists explain eight skin conditions you can pick up at the gym, plus what you can do to protect yourself. What Is Ringworm? Though the name calls to mind gruesome images of parasitic larva, there's no actual worm involved in this common skin condition, says Joshua Zeichner, M.D., director of cosmetic and clinical research in the department of dermatology at Mount Sinai Hospital. Ringworm is just a superficial skin infection caused by fungi. Where It's Lurking: You can catch it from any warm, moist surface. So, pretty much anywhere in the gym! From workout benches and saunas to towels and treadmills, these microbes multiply in humid conditions. They can also hitch a ride on your fellow gym goers who can pass it on to you through skin-to-skin contact. That’s why ringworm runs rampant among athletes who play contact sports like wrestling, says Y. Claire Chang, M.D., a board-certified dermatologist at Union Square Laser Dermatology. Since it’s super contagious, it spreads quickly due to frequent touching. Symptoms of Ringworm: Once infected, you typically develop a ring-shaped rash with red, scaly, raised plaques and a clearing in the center, says Jason H. Miller, M.D., a board-certified dermatologist at Schweiger Dermatology Group. How to Treat Ringworm: Luckily, ringworm is easy to treat with over-the-counter topical creams, says Dr. Miller, adding that oral prescription anti-fungal medications may occasionally be needed to clear the infection. What Is Staph? At your gym, staph bacteria are among the most common germs you’ll encounter. They’re also potentially the most dangerous, since certain types can cause infections in the bloodstream, joints and bones, says Dr. Chang. Typically, though, most staph infections aren’t life threatening. But they are gross to look at (and possibly a little uncomfortable). Where It's Lurking: Staph can be transmitted through skin-to-skin contact, by sharing a soiled towel or working out on a dirty floor mat. Since skin is your first line of defense against infection, people with wounds or cuts are at increased risk, says Dr. Zeichner. Even the slightest shaving nick or an insect bite can give staph bacteria easy access to the skin and underlying tissue. Similarly, you might be more susceptible to staph if you have a weakened immune system or a pre-existing skin rash such as eczema, says Dr. Miller. Symptoms of Staph: Staph infections present like yellow crusted lesions, painful red pimples or larger abscesses of the skin, says Dr. Miller. Sometimes, infected areas feel warm to the touch, and you might even get a fever and chills. How to Treat Staph: Odds are you’ll need the assistance of a physician to treat a staph infection, which can be stubborn, or, in some cases, more serious. Usually, dermatologists will drain your lesion or prescribe an antibiotic. What Is Athlete's Foot? Caused by a similar type of fungi, athlete’s foot is like ringworm’s sibling, says Dr. Chang. Though men tend to be more commonly affected, women are fair game for fungi, too! Plus, anyone who wears occlusive footwear — like heavy boots that don’t permit feet to breathe — might be at greater risk, she says. Where It's Lurking**:** Like its nasty relative, it spreads by contact with infected persons or walking barefoot on contaminated surfaces, like dirty mats, locker room floors and pool areas. Basically, any environment that promotes humidity or sweating is ideal for fungal growth. That’s why fitness centers are fertile ground for fungi. Symptoms of Athlete’s Foot: The first sign of infection is typically red, flaky, itchy skin on the soles of your feet as well as white, macerated skin between your toes. How to Treat Athlete’s Foot: Medicated creams like econazole, ketoconazole and miconazole usually do the trick. Dr. Chang also recommends at-home vinegar soaks, which can help kill microbes that cause foot infections. However, for more severe or recurring cases, you might need to see your dermatologist who can prescribe a stronger oral anti-fungal treatment. What Is Folliculitis? Folliculitis is an inflammation of the hair follicles. Though it’s most commonly caused by bacteria like staph, the infection may also result from fungi or blocked sweat ducts, says Dr. Miller. Working out may make you more vulnerable, too, says Dr. Zeichner, explaining that high levels of sweating, friction or chafing can raise your odds of developing folliculitis. Things like frequent shaving and wearing tight workout clothes can inflame and damage your hair follicles, giving germs easy entryway past the broken skin barrier to infect you. Symptoms of Folliculitis: It usually resembles an acne breakout with tiny red bumps or pus pimples surrounding hair follicles. To add insult to injury, the pustules might also be painful or itchy. How to Treat Folliculitis: “Traditional acne cleansers may be useful in treating folliculitis since benzoyl peroxide helps lower levels of bacteria on the skin,” says Dr. Zeichner. If your symptoms persist, you might need a trip to your dermatologist. He or she can prescribe a stronger oral or topical antibiotic to knock out the infection. What Are Plantar Warts? Plantar warts — which are caused by human papillomavirus (HPV) types 1,2, and 4 — are thickened skin growths usually found on the soles of your feet. Where It's Lurking: “You develop them through direct exposure to the virus, which may be more common in hot, humid environments,” says Dr. Zeichner. Think: locker rooms, showers, saunas and pool areas. And, like other infections, having cracked or damaged skin on your feet increases your risk, says Dr. Miller. Symptoms of Plantar Warts: They’re rough to the touch and look like bumps speckled with small black or red dots. Other symptoms vary, says Dr. Chang. Some people feel no discomfort near the affected area while others feel pain or pressure when walking. How to Treat Plantar Warts: If you’re lucky, they’ll resolve on their own, but you can speed up the healing process with some home therapies. Dr. Chang recommends using an over-the-counter salicylic acid wart remover twice daily and covering the spots with adhesive tape, which deprives the warts of air and may help to wipe out the infection. Stubborn or larger lesions may require more aggressive interventions. In these cases, your doctor might file down your warts or freeze them off with liquid nitrogen. What Is Jock Itch? As the name implies, it’s an irritatingly itchy or burning scaly, red fungal rash that affects the inner thighs and genital region. Where It's Lurking: Like ringworm and athlete’s foot, jock itch thrives in damp, humid conditions and spreads easily through skin-to-skin contact and exposure to contaminated surfaces. “Sweaty, dirty gym equipment is an ideal environment for fungi to grow,” says Dr. Chang, adding they can live on carpets, towels and shoes as well. And, believe it or not, you can spread jock itch to yourself, too! If you already have athlete’s foot, the infection can spread upwards to your groin, says Dr. Miller. You’re also at greater risk if you routinely wear tight, non-breathable gym gear and sweat excessively, which create moist crevices in your skin and increase the chances for fungal overgrowth. Symptoms of Jock Itch: If it feels like you’ve got ants in your pants, and you’re scratching your groin area more than usual, you might be suffering from jock itch. How to Treat Jock Itch: Despite its unpleasantness, jock itch is usually easy to treat. Dr. Zeichner suggests applying an over-the-counter anti-fungal cream like clotrimazole. If the rash doesn’t improve after a few days, see a dermatologist to ensure correct diagnosis and treatment, since other skin conditions like psoriasis, candida and erythrasma may also occur in the groin area. What Is Nail Fungus? “The same type of fungus that leads to athlete’s foot can also infect the nail itself,” says Dr. Zeichner. Where It's Lurking: Like athlete’s foot, you’re likely to encounter these germs in hot, sticky, moist environments like locker rooms, showers and pool areas, and of course, you can catch the infection directly from another person. And if you’re already dealing with a case of athlete’s foot, you better treat it stat_,_ says Dr. Chang. Otherwise, the fungus may spread to your nails. Symptoms of Nail Fungus: It’s not pretty — yellow, thick and crumbly nails, usually on your toes. Bad news for those of you looking forward to sporting flip flops and sandals this summer! How to Treat Nail Fungus: Topical anti-fungal agents are available, but they’re not always effective since fungus usually resides deep beneath the nail, says Dr. Miller. Generally, you’ll require an oral medication to clear the infection for good. But the healing process is a slow one, so you’ll needs lots of patience. According to Dr. Chang, it can take many months for your toenails to grow out normally. What Is Tinea Veriscolor? Tinea versicolor is a pink, scaly rash with oval patches that typically occurs on the neck, chest and back. It’s caused by an overgrowth of normal yeast on the skin and can last for weeks, even months. Where It's Lurking: The good news? Tinea versicolor isn’t contagious. But sweating at the gym does increase your chances of developing the rash, especially if you have oily skin. “When the weather becomes warm and hot, and we sweat more, it creates an environment that allows yeast to grow at high levels,” says Dr. Zeichner. Symptoms of Tinea Versicolor: As mentioned above, you'll notice a pink, scaly rash with oval patches on the neck, chest and back. Thoroughly grossed out yet? 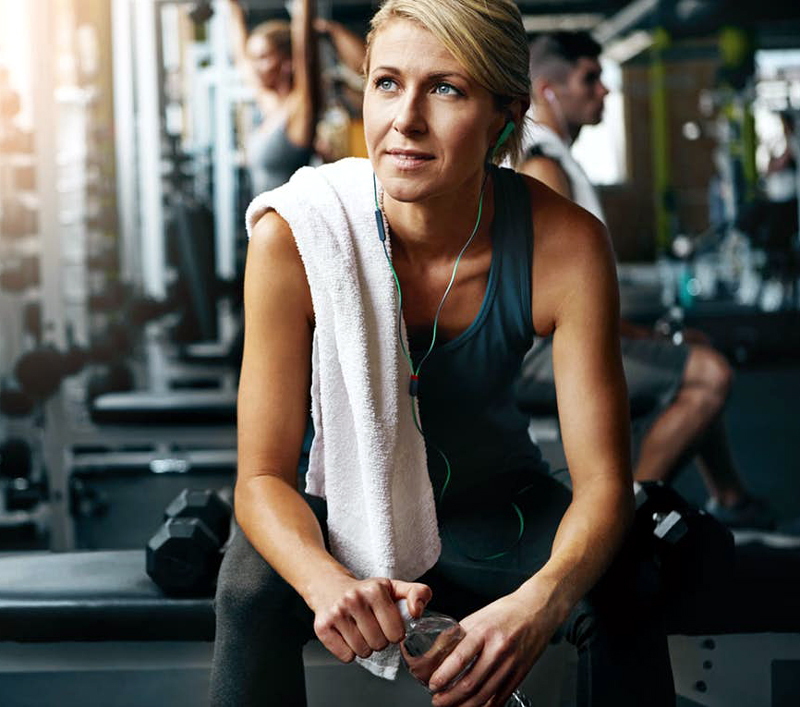 You may not be able to avoid gym germs completely, but following a few simple safety rules can lower the likelihood of taking them home with you. Always wear shoes. Yep, even in the shower! Wear clothing that minimizes exposed skin but avoid anything too tight that traps moisture. Instead, opt for loose-fitting, cotton clothing that allows cool air to flow around the skin. Disinfect all surfaces that will contact your skin using antimicrobial wipes before and after exercising, like treadmill handles and screens and weight machine seats and handles. Change out of sweaty undergarments and shower ASAP after exercise. Avoid sharing towels or other personal items and use clean towels each time you shower. Always dry off before dressing. Don’t forget the spaces between your toes! Slip into your socks first — before underwear or pants — to avoid “pulling up” an existing fungal infection from your feet to the rest of your body. Keep open wounds or cuts covered.